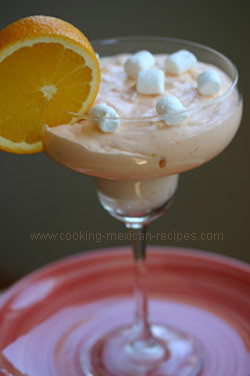 Looking for a nice light dessert to finish off that Mexican dinner? This orange fluff jello salad recipe could be just what you are looking for. It’s made with mandarin oranges, crushed pineapple, and real whipping cream. If you really must, you can use cool whip but if you were to read the ingredients on the container, you would find a lot of ingredients you wouldn’t want to eat. High fructose corn syrup, hydrogenated vegetable oil, and artificial flavors are a few of the ingredients you might want to avoid. But enough of the unhealthy stuff. Spoon this creamy and healthier dessert into margarita glasses with a slice of orange and maybe even a sprig of mint and it fits in beautifully with a Mexican theme. Any type of wine glass will work too. The nice thing about this jello salad recipe is that you can play around with the ingredients. Try adding some chopped walnuts or coconut for variety. Want to add a splash of color? Add a sliced strawberry on top. Serves 8 to 10 depending on the size of your glass. Add 1 1/2 cups of hot water to jello in a large bowl. Mix well until all disolved. Let this cool on top of your counter until it is cool enough to put in the refrigerator. Cool in the refrigerator approximately 15 to 20 minutes. You don’t want the jello to set up and get firm. You want the jello to be cool and when you stick your finger in it comes out with an orange coating. The jello is still in liquid form. Next, whip the whipping cream with the sugar until you have firm peaks. Fold the whip cream into the jello until combined. Add the pineapple and mix well. Add the mandarin oranges last and fold in gently so as to not break up the oranges. If you would like to serve this in individual glasses (like in my picture above), pour it immediately into each glass. If will fill the glass evenly and have a nice presentation. I topped mine with mini marshmallow and a wheel slice of orange. Looks festive doesn’t it? If serving a large group, you can leave it in a serving dish and chill well before serving. Enjoy! Leave me a comment below and tell me how you liked this recipe or how you changed it.